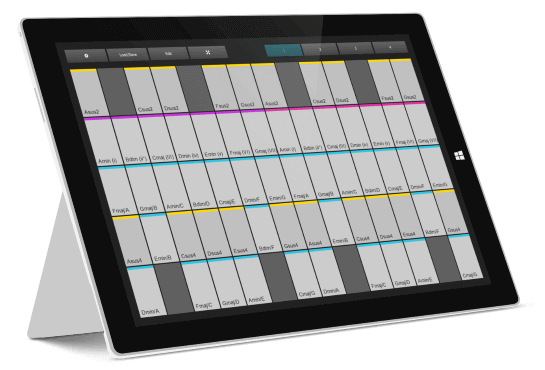 XotoPad turns your multi-touch device into a MIDI instrument controller with chords, scales, faders, and more. Designed for both travel and studio productions, XotoPad is your secret weapon to quickly sketch and refine your musical ideas. The clear interface gives you everything you need to play virtual instruments on the go, sketch chord progressions, create dynamic beats, and control effects inside your DAW. Choose from one of over 300 scales and XotoPad will generate an optimized scale player page for you. Whether you want to sketch a melody or do a live act - you will never need to remember the right notes again. Additionally, a built-in isomorphic page wizard can be used to create touch friendly keyboard layouts easily. XotoPad contains a special chord page wizard that calculates the most important triads and four note chords for you. Just pick a scale and a root note and XotoPad will do the rest. You can also copy chord pads from one page to another. This way you can build your own action pages for live playing. Never hit the wrong chords again! Whether you want to automate pan or volume in your DAW, play some nice drum fills, or control your MIDI hardware - XotoPad will give you everything you need. Faders, sliders, x/y-controllers, CC pads, MIDI note/chord buttons: It's all there. Just select one of over 300 scales and XotoPad will calculate the most important triads and four note chords. Jam around freely - you will always play on the safe side. And of course you can use your DAW to record the MIDI notes straightaway. Run XotoPad in windowed or in full screen mode. Use the transparency setting to keep your DAW in sight. Activate the "always on top" feature to keep XotoPad at hand. The last window settings will be remembered for the next start. XotoPad gives you four pages to work with. Each page can contain up to 18 x 18 pads. Use copy and paste to transfer pad and page settings without effort. You can load and save both pages and page bundles for different situations. Whether you need a page with eight faders, a scale keyboard, or a single x/y-controller: Different setup wizards will help you to build a dedicated controller within seconds. Is your 88 key MIDI keyboard too heavy for the weekend trip? Does your mixer console fill up your backpack? XotoPad will merely add some bytes to your hard disk. Very customizable and user friendly. I am using it with loopmidi and Ableton and it works perfect. It is a very fun application and proving to be more useful than I had imagined a touch controller could be. And it looks super cool. Great Work! Matt B. Just tried Xotopad 2 after trying the demo of version 1 awhile back and was blown away. Awesome program! I had to purchase it immediately and can't wait to setup templates to incorporate into my regular workflow. I have the surface pro 3 and it works like a dream in every way. Javon A.
I just wanted to thank you for creating the Xotopad. It is exactly what I’ve been looking for for some time now. I love writing and recording, and only have a tablet at the moment. It has been workable, but somewhat painful trying to do it with just a mouse, keyboard and touch. The Xotopad is incredible! The setup customization options are out of this world. It has made my process 10x as fast and truly very enjoyable again. This is the best money I’ve spent in a very long time. Brian L.
The original XotoPad has been my favorite, most-used midi utility for some time. My windows tablet never leaves my side, and I spend hours a day with Ableton Live and various other DAWs and midi/music applets, etc. XotoPad 2, in my opinion, is just miles ahead of anything else in its category [...] XotoPad 2 is a masterful combination of simplicity, functionality, and reliability. William B. 1) Download XotoPad and install it. 2) You will need a "virtual MIDI cable" to send MIDI notes or controller values to your DAW. The free LoopBe1 from nerds.de is highly recommended. Simply install it and it will register itself as a virtual MIDI driver. Set the MIDI out device of XotoPad to LoopBe1. Then open the settings of your DAW / other MIDI software and choose LoopBe1 as MIDI input. It is also possible to connect XotoPad to another computer using WiFi. Take a look here for a more detailed description. 3) Open XotoPad. Click on the numbered buttons to switch between the different pages. Click on "Load/Save" and you will see another view where you can load scales, chords, faders, etc. You can change the properties of a pad by clicking "Edit". A detailed guide for these settings is available in the manual. I use Share-it for sales. They offer many secure methods of payment including credit cards and PayPal. You will receive a serial via email with which you can unlock the demo once your offer is processed. Please note that there is no physical delivery.